Are you looking for a video editing service for your company videos & marketing? Hi, Andrea here. My main passion and core focus is on helping you with your company videos. Because videos play such an important role for your business to reach out to your potential and current clients, I have shifted the core of my services and support in that area. Instead of me trying to be a jack of all trades, I wanted to give you the absolute best of my skills to this very important part of your marketing efforts. I have invested heavily in top-of-the-line professional editing and design tools, computer hardware, video assets, and my own personal video education to bring you the professional results you want and deserve for your video projects. While I don’t shoot the actual video footage, like a video production company would do, I will take your video footage and other elements to create a spectacular, professional, and polished video you’ll be proud to show off. Can I See Some Examples Of Your Videos and Video Styles? What Style Of Video Can You Create For Me? What are Ways I Can Use Video For My Business? What Will My Custom Video Cost? And What is Included? What are your “Marketing Actions” services? How Long Does It Take To Get My Completed Video From You? Videos are still a mystery to many, and a struggle for most. I’m here to help you change that. Let’s get started! And if you are ready to get going on a video project with me, there is a video project form at the bottom of this page. Absolutely! Here are some examples provided in a playlist format. I update these playlists regularly, so check back often. Video projects come in many flavors. I help my clients clean up their webinar recordings to make them more professional. On the same note, I can take your teleseminar audio recording and convert them to video, so you can take advantage of the various video sharing sites, such as YouTube and other social sites. This allows you to repurpose your recorded content in a way that you’re not worrying about being in front of the camera. If you’re already utilizing your repurposed content in a variety of mediums, why not add video to the mix and let me take care of the details? I also create custom branded intros and outros that you can put at the beginning and end of your videos. While there is no limit to the number of ideas you can come up with for your video content, here are the 10 most common videos you should focus on for your business. Product or Service Description Videos – OK, so there will probably be a few of these. Creating a video for each product and each service is what you’re going for. Focus on one thing at a time. Here is where you describe the pain your solution solves, and how their life will change when they get your product or service. It’s all about benefits, benefits, BENEFITS! Promotional – there will come a time when you really want to pull out all the stops and create promotional videos for your events, products, and services. Very showy in nature, and can be dramatic for most or all of it in the design and style. Sales Video – this is referring to video sales pages, where often the sales page is nothing more than a video and a “buy” or “opt-in” button. These videos are often nothing more than text and narration or PowerPoint with a voiceover. Sizzle Reel – also known as speaker reels, demo reels, portfolio or montage reels. They are high-end sales presentations with lots of bells and whistles. These are made to impress your viewers! Tutorials/Teaching/Webinar – never underestimate the power of a how-to video to get oodles of eyes to your content and your brand on YouTube and other video sharing sites. Testimonials – if you’re lucky enough to get your clients to provide you with video testimonials, that’s wonderful. But don’t forget about audio testimonials. You can easily create a video using the recorded audio testimonials from your cherished clients. Interview series – adding another person to your video recordings are a powerful way to tap into someone else’s expertise on a like-minded topic that compliments your own. This allows you to greatly expand on the types of content that your audience will truly appreciate. Talk about a win-win for everyone. Sure, the obvious way to pull this off is via a dual talking-head video recording, but as I mentioned above, you can always utilize a recorded multi-person audio recording in a video, while pairing it with some visuals that compliment the message they are hearing. Text, images, b-roll video clips can all come together with the audio recording that will deliver a powerful video that you can distribute. Live video recordings – in this day and age of Facebook Live and other live video tools, it’s quite easy to host live video and push your recording to a multitude of sites. Here, start small and expand as you get your bearings and become more comfortable with the tools and your online persona. Pretty soon you’ll find yourself hosting weekly live video conversations with ease. Not sure where to start? Focus on getting the first 3 of these videos produced, published, distributed online, and on your website. Then branch out to the other videos. By then, you’ll probably find that you’ve been thinking of other content you want to put into your upcoming videos anyway. Getting these initial videos done will get your creative juices flowing! Trust me. Still confused about what to create videos about? Download this list of VIDEO CONTENT STARTER IDEAS. You’ll walk away with at least a year’s worth of video ideas. What Will My Custom Video Cost? In truth, custom videos can range in pricing based on complexity. A 60 second video designed in a simple and clean style that is primarily text-based, a few pictures, background music, and without voiceover is going to be around $200. The same 60 second video designed with a lot of extras such as motion graphics, animations, video clips and images, whiteboard drawn sketches, with voiceover, special effects, background music, sound effects, branding elements, and such will start at $550. It’s all about the design, creative elements, and amount of work involved. This pricing comes with a limited number of average edits (up to 4). If you don’t want to be limited on the number of edits, the estimated cost increases substantially. The more changes you want made during the production, the higher the final costs will be. Especially if your video changes involve any kind of illustrated character/prop/scene animation, which can be a few hundred dollars for about 5-10 seconds of animation. The more story-line concept preparation, scene sequence, style vision, and clarity of your message or story, the easier it will be to keep the costs manageable. The same goes for a voiceover. When I estimate a project that includes a voiceover, it’s for one recording. If the voiceover has to be redone due to changes in the script, that increases the project cost as well. Having your story script and vision concepts is the first step. I never begin designing scenes or animations without these first, as they are costly to develop and construct. PLEASE NOTE: Along with whatever images/footage/music you provide, I will use my library of stock images, stock graphics, stock videos, stock doodles for sketches, stock animations, stock characters, and stock music. Any custom elements will add to the cost. For videos up to 60 seconds, if you need script or story/sequence development it’s an additional $300. Setting expectations for the look and feel of your video up front helps you establish a reasonable budget — and keep within it. Constructing a video is a lot like any other kind of construction project — without specifications, cost estimates are meaningless. Look and feel will depend on the budget to a great extent — 3D and 2D animation and elaborate animation effects are time-consuming and will typically cost more. Remember, I’m here for you. I’ll accommodate whatever budget you have with the appropriate design. Typically, for $375 I can do a 1 minute promotional presentation style video, some pictures and video clips or some 2D animated characters, including some animated text and other animated elements, or with whiteboard sketches, background music soundtrack, some logo branding and contact information. This can also be considered an explainer video, and is the most popular. (the same video would be $550 if a voiceover is added that I am providing). These make great all-purpose promotional videos, sizzle reels, informational videos, and more. It’s a great choice, even without a voiceover. Typically, for $895 I can do a 1 minute premium explainer style video with mostly 2D animated characters (even synchronized facial with voice, like seeing an animated narrator), but including some animated text and other animated elements, WITH a voiceover, background music soundtrack, some logo branding and contact information. These types of explainer videos usually come out best when they include a voiceover, but if you want to save some money I can give you an estimate for your explainer video without the voiceover element. These prices are not including script writing/story sequence, if needed. The script or story sequence is how you tell the story and organize the content to be shown in the video. I can, however, become part of the script/storyboard process if you provide a detailed outline of your content vision and flow of information you want told. Some enhancements that you might consider to raise the bar on the final video would be adding either a voiceover or a video spokesperson. While it does increase the project costs, these items will greatly increase the professionalism of your video. When deciding if you want a simple video design or a more robust video design, you might decide to save your bigger budget for videos that bring you a return on investment, such as promotional videos for your business, products, services, and events that bring you revenue. If you would like an estimate of price for your video project, feel free to COMPLETE THIS QUESTIONNAIRE, and I will get back with you shortly. Custom video projects are a collaborative effort between you and I. Providing me with whatever you can to help me see your vision will result in a video you’ll be happy with. If you cannot participate in this collaborative effort, odds are that the design process and final video will be less than optimal, not to mention costly, if the video needs to be re-designed. Payment is due in advance, except for larger custom videos, where you pay part in advance and the remainder prior to delivery of final video. 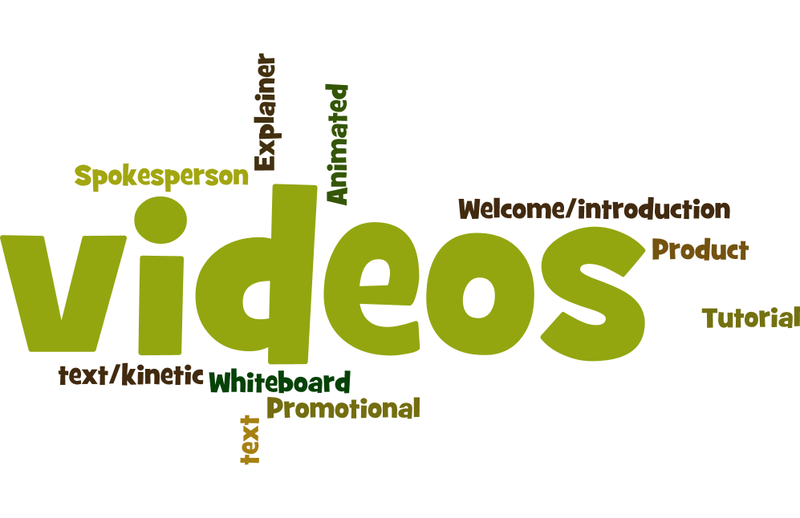 Presentation videos use text (animated and non-animated), and images and video clips of real people, places, and things. They can include talking head portions with you or a video spokesperson. These can also be “explaining” your content, but they are not considered “Explainer videos” design wise. These can have a similar feel of TV commercials. Explainer videos use illustrated animated scenes. Usually a mix of animated text, characters, and props to make up the various scenes. These are 2d style and have a similar feel of cartoons. Whiteboard videos use hand-drawn sketch elements, typically all black drawn sketches. There might be a touch of color here and there, but this is not usually the case. These are drawn stories telling your message. Each tutorial project is different, so I’ll provide you with a custom estimate based on our conversation about the project. Each product project is different, so I’ll provide you with a custom estimate based on our conversation about the project. One: I offer Digital Video Concept Brainstorming & Content Planning, Scripting, Storyboarding & Creation, and Editing for small to mid-sized companies, businesses, entrepreneurs, and solopreneurs. Two: I also offer what I call “Marketing Actions” services. These are how you get the finished videos to the various places they need to be, and using the strategies that need to get done in order to get you noticed, and get you new business. Plain and simple. More details of these services are down further on the page. What are your “Video Marketing Actions” services? When available on the channel, create and use a custom thumbnail. If provided by the client, upload the transcript txt file. If not provided by the client, send the video audio to fiverr for transcription (which would add to the cost). Add keyword rich annotation for the subscribe request. And If You’re a Regular Video Creator and Poster: Advanced Video Optimization Actions – starts at $250/month, depending on which services you get. Enhance your viewers experience by creating categories (keyword-specific playlists, channel category playlists) for the different types of video content you create. Also helps to stack the deck – adding to your marketing strategies. Pull viewers to your website – your home base, keeping the conversation on your turf. Some people prefer to read, as opposed to watching your content. Keeps you top-of-mind. Leverage your existing content. Leverage Social Media to get as many views to your video in as little time as possible. Connect YouTube to your Social Media sites. Set up the YouTube Subscribe Widget on your WordPress site. Set up Social Locker plugin for WordPress. Backlink within your video descriptions. Tracking backlinks to your channel and to your videos, for ranking and authority status. This mostly depends on the complexity and length of the video. Time typically ranges anywhere from 1 week to 4 weeks. We would talk about that during our initial discovery meeting. I require 50% of the estimated cost up front. The final payment is due upon completion and approval of the final video, which will be a watermarked version. The final product will be sent to you when payment is received. Depending on the complexity of the project, you’ll complete a questionnaire about the project purpose and details. Any branding information you require to be included, such as colors to include and to avoid. Links to examples of videos you like, and that you would like to influence the design of your video. You can use the contact form below to start the conversation to discuss your video project.